Let's discuss the rejected alternate endings to Breaking Bad, because what else are we going to talk about? While last night’s Breaking Bad finale officially ended the speculation about what might happen, it also commenced the speculation about what might have happened—a brief grace period to ease the transition, before we all begin the lifelong struggle of learning how to make conversation without talking about Breaking Bad. 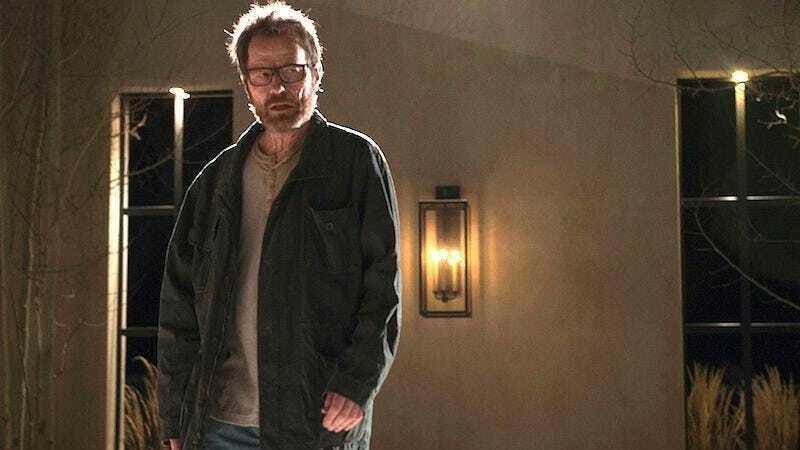 And while Vince Gilligan and the cast already discussed plenty about what went into “Felina” on the finale of Talking Bad, right before they blew up Chris Hardwick, there’s even more over at Entertainment Weekly, where a wrap-up interview with Gilligan and another with Bryan Cranston and Aaron Paul cover the alternate endings, possible epilogues, and everything else you might to want to read, rather than face the emptiness that awaits after you no longer have Breaking Bad to think about. Not that even the man who portrayed him wouldn’t have felt like maybe Walt kinda deserved it: “Because of his love for his family, there was a thought of mine that, ‘Would it be a more perfect hell for him to have to see his family die—his wife, his son, baby daughter—and he lives?’ And there’s some merit to that too,” Cranston says of this punishment worse than even Mr. Magorium’s Wonder Emporium. But ultimately, Gilligan says they went with the ending that felt most like “a victory. [Walt] has managed to make his family financially sound in his absence, and that was really the only thing he set out to do in that first episode. So, mission accomplished.” Still, Gilligan won’t go so far as saying Walt achieved any sort of redemption: “It could be argued that he pays for his sins at the end or it could just as easily be argued that he gets away with it,” he says. And no doubt that’s what fans will be doing from here on, given that we won’t have anything new to argue about. As for what that life might look like—one of the few open-ended questions of the finale—Gilligan likes to think that Jesse will begin his “long road to recovery” by starting over, saying, “The romantic in me wants to believe that he gets away with it and moves to Alaska and has a peaceful life communing with nature.” Aaron Paul elaborates, “I think he probably goes and says bye to Brock, if he can, or at least just sees him from a distance and then he leaves. Maybe Alaska, maybe New Zealand. Becomes a bush pilot.” And hey, maybe he meets another emotionally scarred, bearded guy in the wilderness who’s done horrible things, and they spend the rest of their lives starring in crossover fan fiction. It’s all open to your imagination, which is all you have left now that Breaking Bad is gone.